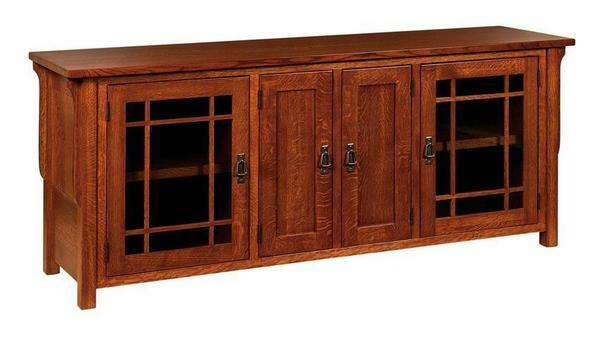 At 72-inches-wide, our Amish Lancaster Mission Solid Wood TV Stand is not for the casual TV viewer or a wallflower. Solid hardwood construction makes a statement, as do mission details like mullions on the lightly smoked glass doors and corbels on either side of the piece. The 1-inch thick rectangular top wills you to set your prized television atop its strong, wood frame. This stand isn't only about looks, though -- it also has substance. Behind the glass doors, two adjustable shelves sit ready to house your electronic equipment. Behind the two wood doors, four CD-DVD pullouts will protect all of your favorite music and/or movies. Cord holes behind the glass doors also offer easy access to power cords and soft-close concealed hinges will prevent the doors from slamming from your excitement over another Princess Bride movie night. Shown in quarter sawn white oak with Michael's Cherry Stain and #17 hardware. Available in two depths: 18 or 21 inches. Choose from a variety of wood type, finish, and hardware options to make it yours.